Comfortable Home Near Mountain Creek & Golf! Enjoy the perfect all-season retreat to escape the hustle and bustle of the city! Load up the mountain bikes, golf clubs, hiking boots, or bathing suits to take advantage of the many surrounding activities at this 2-bedroom, 2-bathroom vacation rental condo for 6. Visit nearby Mountain Creek Resort and Crystal Springs Golf and Spa Resort for both winter and summer sports. Try horseback riding, hike the Appalachian Trail, or golf at one of the nearby courses! This beautifully appointed condo features 1,150 square feet of living space making you feel right at home. The living area with high cathedral ceilings and expansive windows overlooking the Black Creek Sanctuary wetlands, is the icing on the cake. Featuring high-speed Internet, a Smart TV equipped with Hulu, Netflix, Amazon and Blu-ray, a gas fireplace, a washer and dryer, and fully stocked with towels, blankets, and basic toiletries, this property provides all of the comforts of home and then some. The kitchen is fully-equipped and boasts all of the necessary appliances, including a blender with a food processing attachment, stove, dishwasher, and new microwave and refrigerator. Gather with family or friends to dine on the deck or around the dining table while you take in wetland views. Before settling down for a quiet, peaceful night in the cozy queen-sized beds made up with 1,000 thread cotton Egyptian sheets and luxurious duvet covers, take the time to play an assortment of fun family games, enjoy the on-site children's pool, swimming pool and hot tub, or roast marshmallows on the outdoor firepit. The stunning scenery viewed from the living area and deck does not disappoint. Whether clothed in gorgeous fall foliage, spring and summer greens, or winter whites, the mountain vistas will melt away your stress. 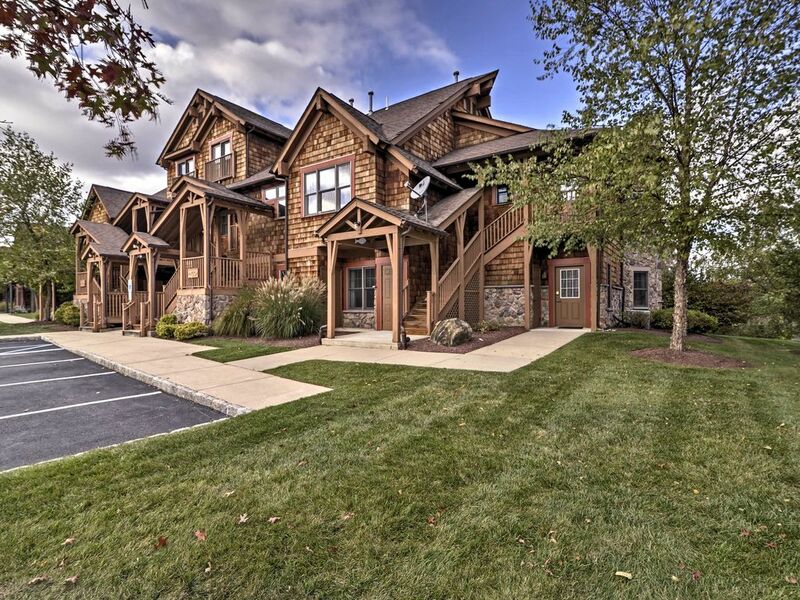 Located in the heart of the New Jersey Skylands region, the gated Black Creek Sanctuary Neighborhood is an all-season resort nestled against the Black Creek wetlands, just steps away from abundant wildlife, walking paths, picnic areas, and birding huts. Crystal Springs Resort, known for its rejuvenating day spas, a state-of-the-art sports complex, and six extraordinary golf courses, is only minutes away. Some of the best golfing in Northern New Jersey can be found at award-winning Ballyowen, Wild Turkey, and Hickory Hill. Mountain Creek Action Park offers the thrills of world-class mountain biking or the refreshing diversions of a dynamic waterpark. And, don't miss the chance to fly through the air at nearby zip-lining. There's so much more to explore throughout the area, you won't know where to go first: the quaint village of Warwick, NY, local wineries, pick-your-own fruit farms, or the many Sussex County State Parks. During the winter months, buckle up your ski boots and hop the Black Creek Sanctuary ski shuttle, available upon request, to the Mountain Creek Resort ski area or the DropZone Snow Tubing Park, a two-minute drive away! - Amenities include air conditioning, central heating, fully-equipped kitchen, a barbeque area, fire pit, free WiFi, a variety of games, community pool access and much more! - If you stay 5 nights, you get the 6th night free! Didn’t use amenities as we thought we would but nice to have option. Perfect for our family. Great views, cozy, awesome tub. Just wish the weather were warmer so we could have explored more. The place was clean, spacious, nicely decorated. It was the perfect place for a peaceful getaway! The shuttle service to & from the mountain was a great perk! Great property!!! Can't wait to come back! My family and I had a great visit at this home. We were constantly watching the wildlife in the stream behind the house. There is even a little trail with a bird watching station that leads you right by the water. Our children enjoyed playing on the community playground, which was clean and well maintained. The space was comfortable and quiet, and I especially enjoyed relaxing in the oversized tub. The kitchen was stocked with all of the utensils and cookware that was needed. Overall it was an excellent experience and we'd definitely like to return.